The tool, discovered by anthropology PhD candidate Andrew Gillreath‑Brown from Washington State University, dates back to the Ancestral Pueblo people of southeast Utah, who lived 2,000 years ago during the Basketmaker II period (around 500 BCE to 500 CE). The 3.5-inch-long device, created over 1,400 years prior to the arrival of European colonists, was made from a sumac tree stem, yucca leaf strips, and the sharp spines of a prickly pear cactus, the tips of which were stained in black. The discovery, chronicled in a new study published last week in the Journal of Archaeological Science: Reports, is more than a thousand years older than other early evidence for tattooing in western North America. Tattooing as a practice has very ancient roots. Ancient Egyptians were tattooing themselves as far back as 5,000 years ago, around the same time that Bronze Age Europeans were doing the same, as evidenced by the 61 tattoos found on the mummified remains of Ötzi The Iceman. Post-Columbian indigenous North Americans also engaged in the practice, but evidence dating further back in time is severely lacking. Unlike the mummies of ancient Egypt and the ice-preserved remains of Ötzi, mummies are hard to come by in North America. And because soft tissue doesn’t preserve very well, any direct traces of tattooing have been obliterated. 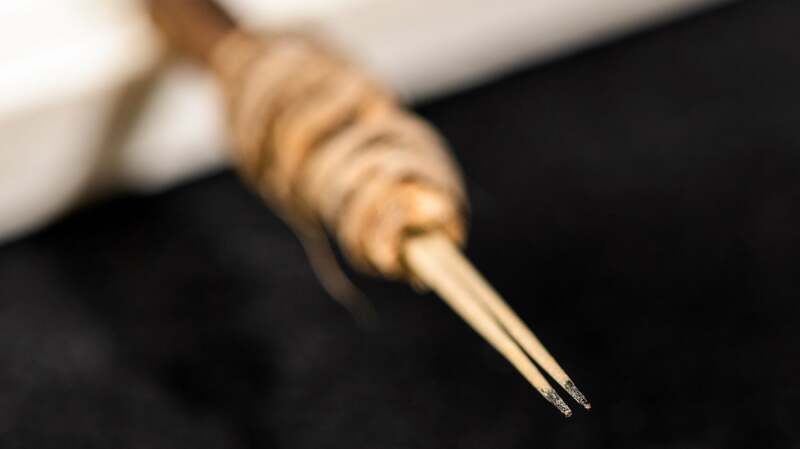 Prior to the new discovery, the oldest evidence of tattooing in western North America came from bundled cactus spine tattoo tools found in the states of Arizona and New Mexico dating back to between 920 to 740 years ago. The new discovery pushes tattooing in western North America back another 1,000 years. The item was uncovered at Utah’s Turkey Pen archaeological site in 1972, but it remained forgotten and unidentified for 45 years. Gillreath‑Brown stumbled upon the artefact in 2017 while inventorying and re-evaluating archaeological items from Turkey Pen, which were kept at a Washington State University storage room for decades. When he saw the relic, Gillreath‑Brown was struck by how much it looked like the tattooing tools found in Arizona and New Mexico. The tattoo tool itself wasn’t directly dated, but the researchers analysed organic materials found in the sediment where the tool was found, allowing for carbon dating. Gillreath‑Brown recruited study co-author Aaron Deter‑Wolf, an expert on ancient tattoos from the Tennessee Division of Archaeology in Nashville, to help with the analysis of the artefact itself. The team used various instruments to study the black tips of the cactus spines, including a scanning electron microscope and X-ray fluorescence. Results showed that the black stains were a pigment made from carbon—a common and easily accessible material for tattooing. Not content to leave it at that, the team embarked on some experimental archaeology. A functional replica of the device was made using similar materials. For the ink, the researchers created a black slurry made from charcoal and water. In a series of experiments, the device was used to successfully tattoo fresh pig skin, which the researchers got at a local grocery store. James D. Norris, an experimental archaeologist from Kent State University who wasn’t affiliated with the study, said the relic is “without a doubt” a tool used for tattooing. Previously, scientists had to make inferences about the existence of the practice in ancient North America, such as studying depictions of tattooing on figurines and pottery, but “now we have concrete evidence backed with experimental archaeology that tattooing was done back then,” he told Gizmodo. As for the reason behind the practice, Norris said we can only speculate. The new discovery is shedding light on the past, but as Norris pointed out, it carries implications to modern culture as well.